This report presents the most important results emerging from a research project undertaken within the framework of the joint analysis, assessment and research activities coordinated by the government (VN TEAS). The aim of the project has been to comprehensively evaluate the impact of wage subsidies on unemployed persons’ subsequent employment and earnings, whereby the focus has been on the system of wage subsidies in place in the early 2010s and the major reforms implemented in the beginning of 2015 and 2017. In producing the evaluation results reported we have followed the approaches of leading international studies on the impact of wage subsidies and applied state-of-the-art matching methods recently developed in the field. The rich Finnish register data available to researchers has made it possible to carry out matching analyses of high quality by international standards. The evaluation results obtained from using matching methods have, whenever suitable, been supplemented with descriptive information on persons becoming employed via wage subsidies. A broad-based review of both the international and the national research literature within this particular field lays the ground for our analyses. The reported evaluation results are in line with previous findings in international and Finnish studies of the impact of wage subsidies. In particular, subsidies paid to firms tend to improve the post-subsidy earnings of those hired via wage subsidies, and also increase their employment months while simultaneously decreasing their unemployment months. These effects are not found to be large, though. Moreover, longer-lasting wage subsidies seem to slightly strengthen the evaluation results. In contrast, subsidies paid to the municipality sector or to other private-sector actors are found not to be a workable solution in situations where the main target is to enhance open labour-market employment of those hired via wage subsidies. This raises questions about whether differently planned and implemented wage subsidies or an entirely different measure would be a more effective solution for these two sectors. 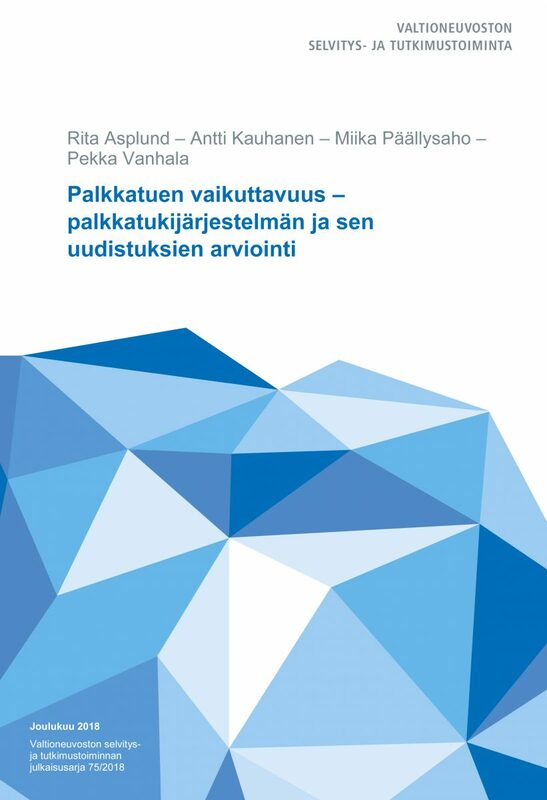 With respect to future evaluation research on active labour market policy measures it would be of utmost importance to proceed also in Finland in the direction taken in Denmark and Sweden, where active labour market policy evaluations nowadays mostly rely on randomized controlled trials. Additionally, more attention should be paid to evaluating comprehensive or overlapping measures, as well as to performing cost–benefit-analyses. Publications of the Government’s analysis, assessment and research activities 75/2018.